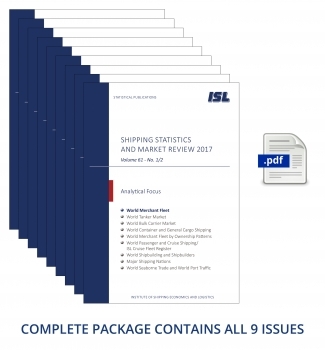 Each issue of the SSMR includes an “ISL Market Review” with leading indicators to reflect market trends continuously, namely: Economic indicators, World merchant fleet, Freight and charter market, Shipping prices and costs, World shipbuilding, World port traffic. We differentiate between 28 separate indicators which reflect relevant market developments on a monthly and quarterly basis. Short commentaries on the development of individual markets.